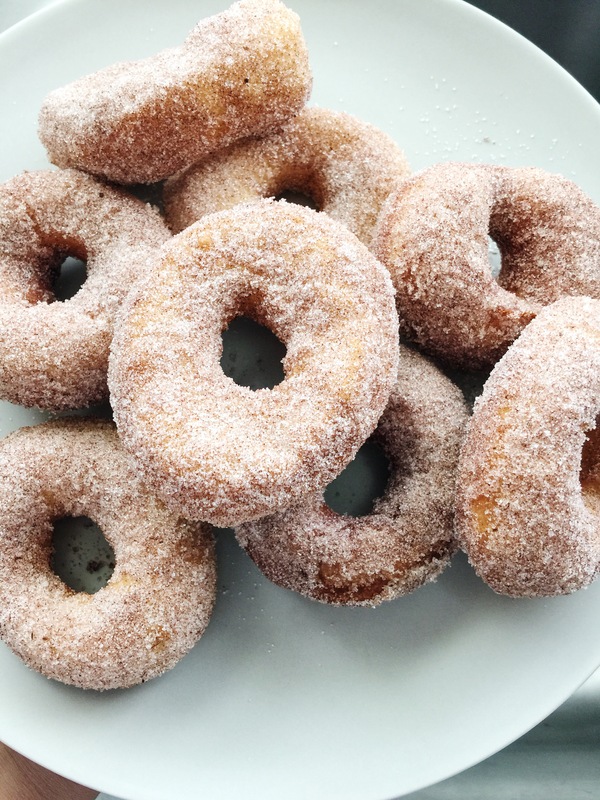 These are probably the easiest doughnuts you’ll make. Mostly because you don’t have to pull out mixing bowls, make glaze or wait for them to rise. If you’ve got a couple of cans of refrigerated biscuit dough, some oil and a little cinnamon sugar, then you’ve got doughnuts. I like to make these on mornings when I want to surprise my girls with a treat, but I don’t want a lot of cleanup. Of course they’re devoured within minutes of coating them with sugar then their fingers are licked clean and their happy smiles show their appreciation. Make these next time you need a treat, even if it’s for yourself. There’s nothing like one of these made fresh with a cup of tea or coffee. *Tip: Use a small, deep pot for frying. You can use less oil, making cleanup easier! Heat oil in a small heavy pot over medium heat. Place each biscuit round on a flat surface, flatten slightly, and cut a hole out of the center. I used a metal frosting tip, but a knife works fine. Make the hole a little larger using your fingers to stretch the dough. Reserve the little holes. Mix sugar, cinnamon, and nutmeg in a medium bowl or paper bag. Place the dough rounds gently into the oil, and fry, about 2 minutes per side. Remove from the oil and drain briefly on paper towels, then quickly place into cinnamon sugar mixture and roll or shake to combine. Serve while warm. To fry the holes, place them into the hot oil and gently stir with a metal spider or fork to keep them from sticking to one another and allowing them to brown on all sides. Remove to paper towels to drain, then roll in cinnamon sugar as well, Serve alongside the doughnut rounds. These would also be wonderful with a drizzle of melted chocolate or melted Nutella and served alongside hot cocoa on cool nights! I have fried biscuit dough to make jelly filled donuts. And they ARE tasty! Will have to try these with the cinnamon sugar coating. Yum! I bet the jelly filled ones are delicious! Never would have gussed that biscuit dough could be used for doughnuts! Brilliant!